Live honey bee removal is what we are all about, we are specialists in live bee removal and bee relocation. Simply we remove bees from places they should not be, and relocate these bees to somewhere more suitable. We do not kill the bees, we do everything to ensure their survival. We don’t use insecticide to kill the bees before we remove the wax, honey and brood, (if insecticide was used all this would need to be disposed of as toxic waste). We remove bees from places ordinary bee keepers can’t deal with and are not insured to do, and most pest controllers know little about. The honey bees may either be a newly arrived bee swarm or an established honey bee colony that’s been there for many years. No matter the circumstances we can move the bees out and into a new home. Live honey bee removal is completely different from swarm collecting which beekeepers should do for free. Do be very careful if taking advice from bee keepers that are after picking up easy swarms, often when a swarm arrives and enters a spot that is too difficult for a bee keeper to deal with they are tempted to advise that if you leave it the bees could move on in a few days. Often this advice costs, because the bees have not moved on and the cost to remove them goes up as time passes. If you need a properly insured pest controlling beekeeper to remove a honey bee swarm we can do that for you. If we can get to a swarm and remove or flush it out of its new home within the first couple of days then that will save on considerable expense and disruption later. 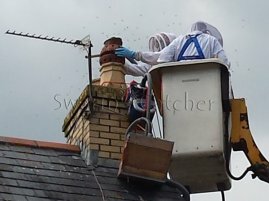 For those swarms that land in chimneys and take up occupation we have fast solutions there too providing we can get to the chimney easily and safely. Generally the longer bees are left in situ the more expensive it becomes to remove and relocate them. If a honey bee swarm is to be removed later costs will escalate. Many swarm collectors when giving out advice about swarms in chimneys will say “leave the swarm be” and “it will probably leave of its own accord”. Please be advised this is very poor advice and most probably given because they don’t want to say that removing them is beyond their skill set, so give you these false statements using them as poorly thought out get out clauses. For bees that have only recently arrived in a chimney or some other part of a property we advise removing them as quickly as possible, preferably within the first couple of days of arrival, even then it can take a couple of hours along with some specialist access equipment. Honey bees will build their hive very quickly, they can build 20 litres or more of comb in a 3 week period (this is like hanging ten 2 litre bottles of milk out in a row). If they arrive in April or May you can expect to find more than five times that in situ at the end of summer. Once the bees have a chance to bring in propolis (tree sap), and the queen has produced a complete brood cycle (21 days from the laying of an egg), the complete complement of the pheromones of the hive will be ingrained in the structure acting as a strong attractant for years to come; so the quicker they can be removed the better. 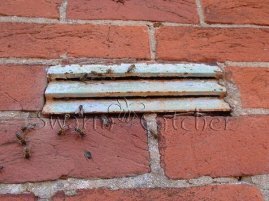 Swarmcatcher specialise in the live honey bee removal of honey bees from chimneys, roofs, brick & block cavity walls, soffits and many other unexpected locations. We carry out these live honey bee removals relocating the living colony to a more appropriate location – usually our apiary initialy. 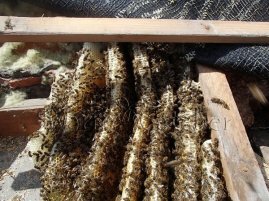 To carry out these live honey bee removals we have developed several sophisticated techniques one of which enables us to remove honey bee colonies from certain locations without having to dismantle the structure and without harming the honey bees. We are at the forefront of bee removal techniques in the UK and offer the best advice and cost effective solutions to removing honey bees alive from your property. Our live honey bee removal service usually includes the removal of not only the bees but the comb and honey as well. This is very important as when left in situ there would also be a residual mass of brood (bee larvae) included with the wax comb and honey stores. This brood will die without the nurser bees to look after it and decompose if not removed; leaving not only foul odors to contend with but also possible staining. Additionally any uncapped honey stores will run and likely add to the mess. Further down the line you may well suffer additional pest infestations, such as carpet beetles, clothes moths, ants, mice or something larger. All of this is prevented by the complete removal of the colony, stores and any dead honey bees that may have gathered beneath the hive. When carrying out a live honey bee removal we will usually vacuum the majority of the worker honey bees unharmed into a bee box, the remainder nurse bees we usually leave sitting on the brood (looking after the bees to be) which we cut out and place into a nuc box, the brood is then kept at the correct temperature by the nurse bees during the honey bee relocation process, on occasion we may assist with the use of heat pads when its cold. The remainder of the colony is removed, the walls scraped down to remove as much wax as possible, and where possible the area beneath the colony is vacuumed to remove all the bees that have died and fallen; there can be several inches of dead bees, which would otherwise be a great source of food for a large infestation of clothes moth or carpet beetle, that once consumed will mean they will be after another food source – your wool carpets, silk dresses, woolen suits and sweaters. If we can’t get to the dead bees we will discuss alternate options for preventing an infestation, and deal with them in your preferred method, normally nontoxic if practical. Once the live honey bee removal has been completed it is necessary to proof the location against the arrival of another honey bee colony. This can be a complicated part of the process dependent upon where the bees have been removed from. In some circumstances such as chimneys they can easily be proofed against after removal, in other circumstances it is in fact impossible. There are some out there giving a guarantee against the re infestation of the same location – that’s a bit of a cheat really isn’t it. After all they are only guaranteeing against the recolonisation of a very specific part of the building or roof, not the whole, because its impossible to guarantee against. To proof a specific section of roof or wall is straightforward but its not practical to proof the whole structure its just way too expensive to do. Because of the strong active scent created by historic bee colonies the new honey bees will only require a 6 mm hole, this can be easily found in tiles and slates. Furthermore sealing all holes may be detrimental to the health of the building as buildings need to be able to breathe. Others are guaranteeing the removal of honey bees – one would hope so, that is after all why they are there, why would you pay them for not removing them? So be wary of any guarantees, like most these days they are unlikely to be very useful. If you really want one after reading it carefully then we will match any guarantee for a fee dependent upon access costs. But upon careful reading you will probably see that it has no real worth, other than that of a great sales gimmick. If you have honey bees in your property please contact us; a photo can be worth a 1000 words so if you can email us a couple showing where they are entering the property, the location of the entrance with respect to accessibility, along with any historic or other relevant information, an address so we can see the property on google, then we can advise on the best approach to removing the honey bees without having to visit. Our online advice is free! For information on bee removal and relocation from roofs you may want to look at our page ‘Honey bees in roof‘, or if you have honey bees in a wall our page ‘Honey bees in wall‘ maybe of use.